Elegant VOLTERRA presentation case in mahogany wood-grain finish. Padded lid with black satin lining and certificate ribbon. Molded black velour insert. Solid construction, gold-plated hinges, secure magnetic closure. Holds 1 MintFirst™ Single Coin. Kitco offers the MintFirst™ QUADRUM Capsule VOLTERRA Coin Box for sale on our online store. Add these MintFirst™ QUADRUM Capsule VOLTERRA Coin Box to your cart as it makes the perfect gift box for bullion or collectible coins. 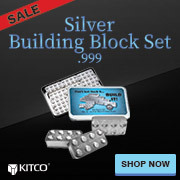 Buy gift box online, buy MintFirst™ QUADRUM Capsule VOLTERRA Coin Box from Kitco today.